Metroid: Samus Returns for Nintendo 3DS is a love-letter to old school Metroid fans, but may need to look at notes from other genre up-and-comers. The concept of a Metroid game seems so odd in 2017; while the Metroid-vania genre seems booming and bustling thanks to the indie market, the series that inspired the genre hasn’t seen a notable successor in (arguably) over a decade. With more than enough frustration over the formats of Metroid: Other M and Metroid Prime: Federation Force, the 2.5D Metroid: Samus Returns is just that — a return to side-scrolling greatness. But returning to a long-untouched genre carries with it obvious obstacles. With ten years past, the Metroid series carries the burden that it should set, if not at least keep up with, contemporary trends and advancements within the genre. This task is even harder when developer Mercury Steam was tasked with re-creating a game well over a quarter-century old. The tricky balance being that the game must modernize enough to appeal to new audiences, while also respect incorporate the source material to please fans that have been calling for the remake. With that said, Metroid: Samus Returns is a game that unabashedly stakes its feet in 1991 with a vivid recreation of Game Boy’s Metroid II: Return of Samus. Unfortunately, additions to modernize gameplay often feel unsatisfying and the game itself comes across as dated by current Metroid-vania standards. Following the events of Metroid Prime: Federation Force, series heroine Samus Aran is called to the Metroid homeworld SR388 to exterminate every living last, HP-sucking facehugger that exists on the planet. 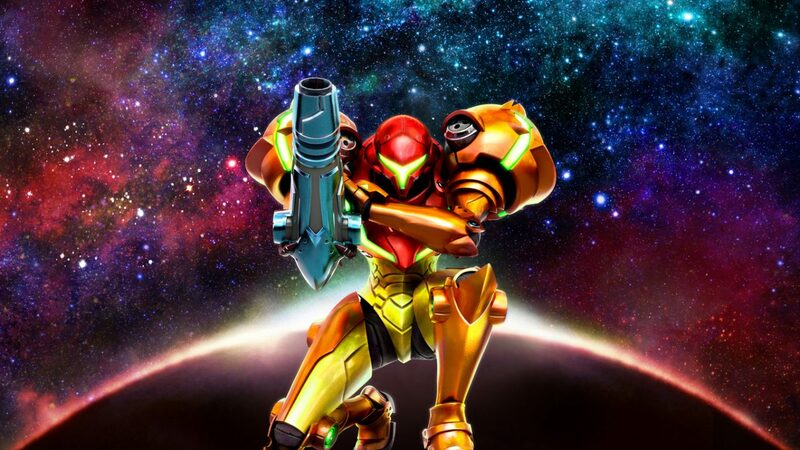 Starting with limited technology, Samus is (predicitbly) tasked in exploring nooks and crannies of the world, collecting power ups, unconvering and solving environmental puzzles, and shooting a whole bunch of enemies en route. Obvious to fans of the original, not much story-wise has changed between the original inspiration and the remade Metroid: Samus Returns. More importantly, the isolation and threadbare narrative still happens to be one of the most entrancing components of the Metroid series. While I’ll never complain about the often dark and twisted narratives discoverable among the Metroid Prime trilogy, Metroid Prime: Federation Force and Metroid: Other M ripped the isolation away to supplement a more digestible, yet unfortunate narrative. Comparatively, Metroid: Samus Returns keeps the stoic, silent protagonist in perspective. Without flavor text or commands barked at you, the story of a lone galactic bounty hunter on a mission feels more actualized — the environment, crafted backdrops, galactic background music, and desolate (albeit enemy-packed) world instead becomes the narrator. The story being written across the 3DS screen is solely confined to the actions you take — whether you are a bean counting collector that needs every door checked, or you are a rogue marauder that takes her arm cannon and as few weapons as needed to settle the score with a world champing at the bit to kill you. And while the story’s environmental narrative has only enhanced in the 25 years since the original’s release, the gameplay (originally tackled on the Game Boy) apparently needed quite a few overhauls to fit with current gaming trends and the Nintendo 3DS. First, a more precise free-aim mode was added: holding a shoulder button and pivoting the Circle Pad will let Samus aim in a full extension across 360°. 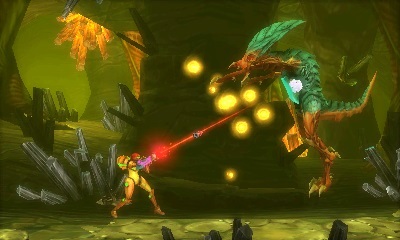 This, of course, is a welcome improvement over the left-up-right shooting options in Metroid II: Return of Samus. However, likely to address the notably severe difficulty of the original title, Mercury Steam added a parry melee system that quickly and solidly dominates gameplay. Every enemy in the game has a form of charge attack — one that is triggered nearly the instant you are in range. After the small telegraphed flash by each enemy (seen below), you will get a brief second or two to hit the melee parry. 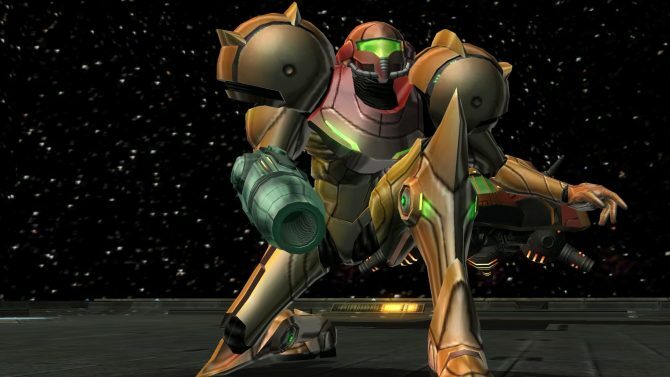 Landing the parry will stun the enemy and slow time, while Samus hones on critical weaknesses; missing the timing typically ends with half of an energy tank drained in punishing fashion. Although the parry mechanic adds a new, interesting way to approach combat, players will find (at least for the first several hours) that you will be entirely leaning on the mechanic. Instead of diversity, it introduces an almost mandatory stop-and-go playstyle that is anything but dynamic. And although there were certainly occasions where I found myself feeling like a god for strategizing a chain of eight parrys, more often than not I felt the fluidity of the gameplay was being sacrificed where an auto aim option could have sufficed. The other big addition to the reworked mechanics are Aeion abilities — magic-like skills that can help uncover secrets, give a protective shield, slow time, or give you rapid-fire shooting capabilities. If you are generally new to the franchise, the secret-finder ability will be an easy crutch to the game, taking the thrill out of finding some of the more mundane hidden locations. With that said, these abilities are somewhat limited — you can only use them so much until your Aeion Energy runs out. Finally, there are a fair amount of gameplay enhancements that curve the notorious difficulty of the original. Thanks to checkpoints, warp points, markable maps, and stackable weapons, the more annoying portions of the game seem bellied. With that said, none of Metroid: Samus Returns’ enhancements feel like improvements without context of first playing Metroid II: Return of Samus — instead, they are commonplace components, long-since added to the genre. Those trying the game from a fresh perspective will easily underappreicate the existence of those added mechanics. Although Mercury Steam took to take generous liberties with the control scheme, there are many components that Nintendo should have experimented with: first and foremost, boss fights. 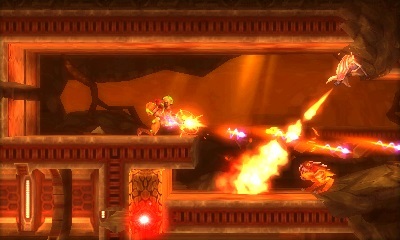 As Samus descends into the depths of SR388, she will have to slowly eliminate every Metroid through each area to clear the toxic liquid that blocks the next area. 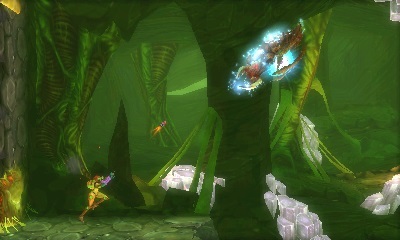 Unfortunately, each Metroid fight will contain one of four enemy types, with the variety being found instead in the map. Though strategies and difficulty remain the same from your first to last Metroid battle, differing terrain may have you alter the strategy. But no matter how developer Mercury Steam framed the boss battles, I still found them frustrating and underwhelming. 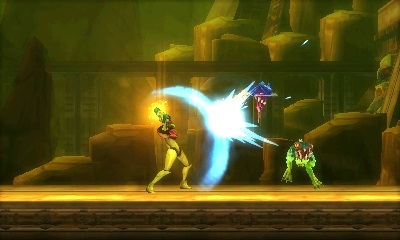 Metroid as a series is known to compete with the Nintendo’s other flagship series, The Legend of Zelda, for some of the most iconic enemies. However, with few exceptions, Metroid: Samus Returns’ bosses were flat-out boring. With Metroid hunting being the primary focus of gameplay, you would think Mercury Steam would put more focus into making these fights stand out. Other issues with the gameplay and presentation range from obvious to more nuanced. On the heavy handed side, every few doors you are hit with the repeated problem that enemies tend to lay in wait of you switching screens. Far too often you are hit with a surprise attack as soon as you run through a door, lending to cautious gameplay tactics in an attempt to avoid draining significant health. More nuanced is the issue that — much like the original — Metroid: Samus Returns’ power progression is underwhelming. While the weapons stack on each other, the enhancements didn’t feel like growing strength. More like finding keys to open different colored doors. Compared to the Metroid Prime trilogy, gaining a new ability felt like a luke-warm experience more often than not. But despite my issues with the gameplay, I do have to note that Mercury Steam did an excellent job crafting the environmental puzzles. Often coupled with some head scratching and navigating through your ever-expanding skillset, you are rarely put in in a situation where you are repeating solutions. While I avoid moment-to-moment combat as often as possible, the varied puzzles are a running testament of Mercury Steam’s ability to build interesting maps — especially to a Metroid scale. Last (but not least) is a running problem I’m having with the underlying hardware, and more of a side-note to this review. Although my New Nintendo 2DS XL was able to run the game competently (albeit with occasional load times), the new and detailed backgrounds seem lost in the dated 240p resolution. Although I was more willing to overlook the graphical limitations six years ago, Metroid: Samus Returns feels like a console swan song where I’m already vying for a Nintendo Switch port. What it comes down to is Metroid: Samus Returns feels like a game that would have killed (and in many ways belongs) in the 90’s. But in a current climate where the game has to compete with powerhouses like Ori and the Blind Forest, HolloW Knight, or SteamWorld Dig 2, the title feels tepid in comparison. 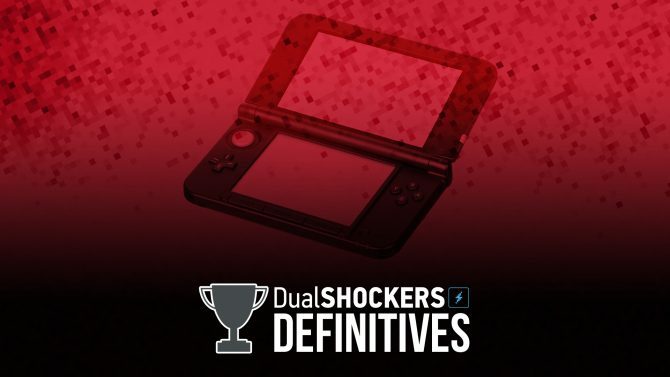 If you have a Nintendo 3DS, the 12 hour campaign to 100% completion is a safe bet for solid entertainment. However, the source material, slowed-down gameplay, or the ever-dated underlying hardware may be what is holding the game back from keeping up with genre competitors. Metroid: Samus Returns is a remake that plays it close to the original, for both good and the bad. 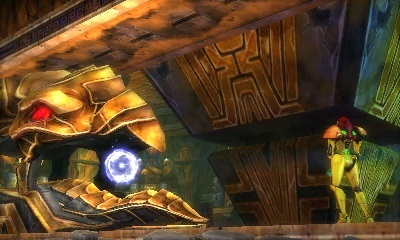 To its credit, the story (or lack thereof) is still a thrilling exercise of environmental storytelling and the puzzles are varied and interesting; however, the lack of boss variety, experimental stop-and-go gameplay, and dated visuals make this Metroid title more of a love letter for old-school fans, and potentially a chore to those more accustomed to contemporary genre norms.